WELCOME TO OUR TIME CAPSULE! Look at the pictures below! Seems almost like we are in a time warp, as Madonna strikes a very similar pose to the one she struck in 1985, and even though it's 20 years later, it really does feel like it is yesterday that we sang "Like A Virgin", loaded up on our jelly bracelets and crucifixes, and danced around in leggings and tights. That's right! The 80's are now back in our special MadonnaMemories trip to that wonderful time. And to truly celebrate those special moments, we have a great surprise for you - an exclusive interview with the first Madonna biographer, Mark Bego! 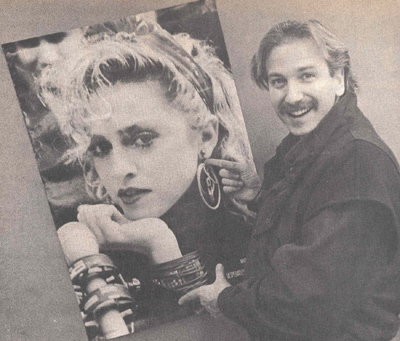 Scroll below or click here for Mark's take on that amazing time, and also read part one of his official interview with Madonna on the set of Desperately Seeking Susan. We also have Bill Lanphier, bass player for the Virgin Tour, answering questions for you, the fans. Look soon for another exclusive interview with Bill, including why "Billie Jean" got included on the tour! We have a great photo gallery that's all 80's, a print-up lyric sheet, scrapbook pages, and a callout for fans memories of Madonna in the 80's. Enjoy these updates and keep checking back for more memories! Does Madonna ever age? We didn't think so either! 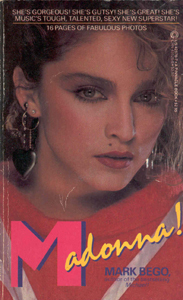 When it comes to 80's Madonna, there has been one author who had stuck to his guns to get an exclusive biography created for our future queen of pop! And that person is the first Madonna biographe r, Mark Bego! We are very fortunate to share this awesome interview with Mark and his thoughts about that time and meeting Madonna! Learn more about the book that started it all, Marks' work with Modern Screen, and more! Click here to meet Mark! The Mark Bego Madonna interview! Read our first part of the fantastic interview between Mark Bego and Madonna! Learn about the MTV Awards, Desperately Seeking Susan, and what her father really thought of her performances! bass player for the Virgin Tour! Bill Lanphier went on tour and played bass guitar, but it just happened to be the Virgin Tour! Read his exclusive interview with questions he answered from fans like you! See great photos like this in our gallery which will be updated weekly! Do you have some great 80's MadonnaMemories? We want to hear from you! Tell us about the first time you heard "Like A Virgin" or saw the "Material Girl" video! We will start sharing these great memories and one entry will get a special Madonna Virgin Tour photo! Do you have a great Madonna collectible to share? Send it to us here! 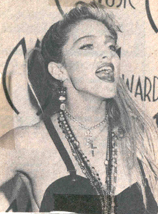 See great rare pics like this in an online virtual 80's scrapbook put together by you - Madonna's fans!